China and Ecuador agreed on Thursday to lift bilateral ties to a comprehensive strategic partnership, in a bid to further strategic mutual trust and win-win cooperation between the two countries. The decision was announced during Chinese President Xi Jinping's state visit to Ecuador, the first of its kind since the two countries established diplomatic relations 36 years ago. In his talks with Ecuadorian President Rafael Correa, Xi said Ecuador is an important country in Latin America. Despite the distance between the two countries, bilateral ties between China and Ecuador have witnessed substantial development in recent years. 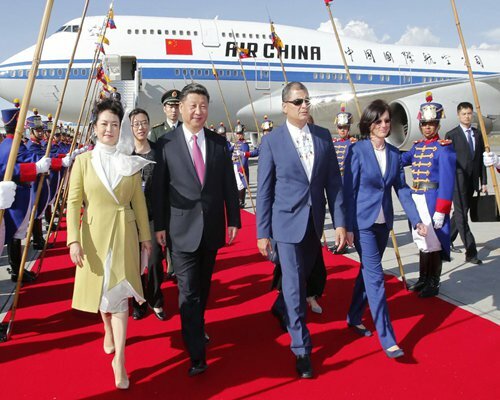 The two countries established a strategic partnership during Correa's second official visit to Beijing in 2015, and Ecuador is now a major destination for Chinese investment and financing in Latin America. Chinese investment and financing in Ecuador exceeds $10 billion, and supports hundreds of projects including major infrastructure ventures. In April this year, Ecuador was hit by a 7.8-magnitude earthquake, and China was one of the first countries to supply humanitarian aid. Since President Correa came into power in 2007, Ecuador has focused on deepening its ties with China. The Ecuadorian president's first official trip to Beijing took place the same year as his inauguration and bolstered cooperation in various fields, including energy, science and technology, trade and education. China has become Ecuador's third largest trading partner, with two-way trade reaching $4.1 billion in 2015, quadrupling the figure from 10 years earlier. Xi noted that since 2015, mutually beneficial cooperation between the two countries has seen rapid development in a wide range of areas, with the scale continuing to increase. Bilateral ties have been greatly enriched and have been gaining momentum toward comprehensive development, he added. China will continue to support Ecuador in exploring a development path that suits its own conditions, and will actively take part in Ecuador's post-earthquake reconstruction work, he said. China is willing to reinforce practical cooperation with the Ecuadorian side in all areas, comprehensively step up the integration of interests of both sides, expand people-to-people exchanges and open up brighter prospects for the development of bilateral ties, Xi said. He went on to pledge support for Ecuador's presidency of the Group of 77 next year, saying that China is willing to maintain close cooperation with the G77 in multilateral affairs. For his part, Correa likened Xi's visit to "a get-together between friends," and said he believes Xi's trip will serve to boost bilateral relations and cooperation, and bring more benefits to people on both sides. Ecuador has always pursued a one-China policy, and is committed to strengthening exchanges and cooperation between the two countries in political, economic as well as cultural and people-to-people fields, Correa said. Also on Thursday, Xi and Correa witnessed the signing of a string of cooperation agreements in the areas of production capacity, investment, industrial parks, economic technologies, judiciary and media.